COMEDY BY: Josh Gondelman, Larry Owens, Clare O'Kane, Karen Chee, Calise Hawkins, & Robert Dean! ANIMATION BY: Bryan Brinkman, Dan Pinto, Jason Chatfield, Patrick Hosmer, Victoria Elena Montes, Rachel Gitlevich & James Sugrue! HOSTED BY: Ian Fidance! Flip open your latest copy of MAD to take a squiz at my cartoon about Moses. I’m sure it won’t put any moses out of joint. April 9th @ Caveat, New York City. Welcome back to a very special episode of Is There Something In This? with your old mates Scott Dooley and Jason Chatfield featuring our good friend, star of the new CBS sitcom "Super Simple Love Story" along with Comedy Central's The Daily Show, and the hit movie Crazy Rich Asians... Ronny Chieng! This show was filmed in front of a live audience in New York. ﻿Subscribe, rate and review in on iTunes! We're inviting you into our living room, don't walk out with our lamp. Please don't steal our jokes. All original content is © Copyright 2019 Jason Chatfield & Scott Dooley for "Is There Something In This?" All rights reserved. We welcome you to download and play the podcast and share with others for personal use; please acknowledge "Is There Something in This?" Podcast as the source of the material. You may not, except with our express written permission, distribute or commercially exploit the content. What happens when you give 8 New Yorker cartoonists free tickets to a burlesque show? 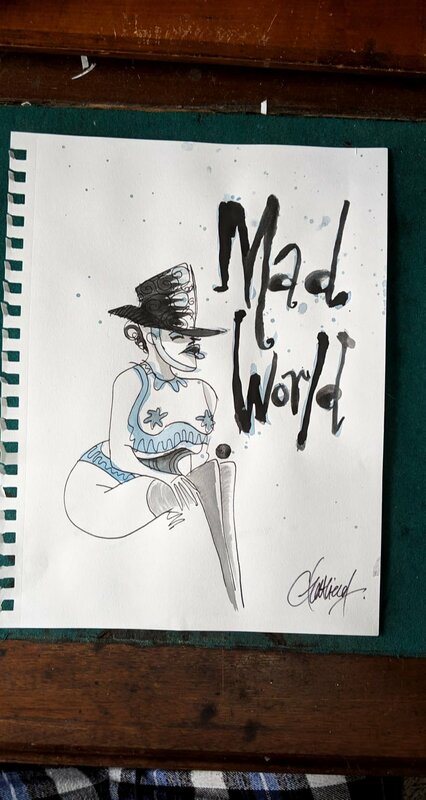 On Friday night a bunch of @NewYorkerMag cartoonists and illustrators were invited to Brooklyn to live sketch the incredible burlesque show #QueenOfHearts by Austin McCormick and Company XIV based on Alice in Wonderland. Ellis J. Rosen, Jenny Kroik, Sofia Warren, Jason Adam Katzenstein (JAK), Hilary F. Campbell, Julia Rothman and Amy Kurzweil. It was so much fun. Minds were blown.🤯 Copious free champagne was drunk. 🥂 See more in my Instagram highlights. Thank you to @companyxiv for the invite and to @sofiawarren for organising it. This year’s NCS Reuben Awards weekend will be taking place among the country’s biggest ever comic arts festival; the inaugural NCSFest! We’re very excited to announce that our next live podcast will be taking place on Friday, May 17 in Huntington Beach, California with special guest Bob Mankoff! After two decades as cartoon editor for The New Yorker, Bob Mankoff was named Cartoon and Humor Editor for "Esquire" in 2017. He launched CartoonCollections.com the following year. Bob will join us on stage in the Marriners Ballroom at the Hyatt Regency at 12:00pm. Surprise Live Podcast Guest Revealed: Ronny Chieng! Thank you to everyone who came out for the live podcast last night, especially so late on a school night. —and a huge thank you to our friend, and special guest from Comedy Central’s The Daily Show and the multi-award-winning film Crazy Rich Asians, Ronny Chieng! Ronny was an hilarious addition to the show, which will go out in the next week. You can subscribe to the “Is There Something In This?” podcast wherever you listen to podcasts. Last weekend I got to perform on what I think is easily the best comedy show in Brooklyn, co-produced by the very funny Ian Hunt. Ian and I also got to collaborate on a crazy one-pager in the up-coming April 16 issue. Check out his podcast “Suicide Pact” with his girlfriend and fellow comic, Catherine Zini.